medical research team at the QEII Medical Centre. awareness of the dangers of asbestos exposure and their lifesaving fundraising. 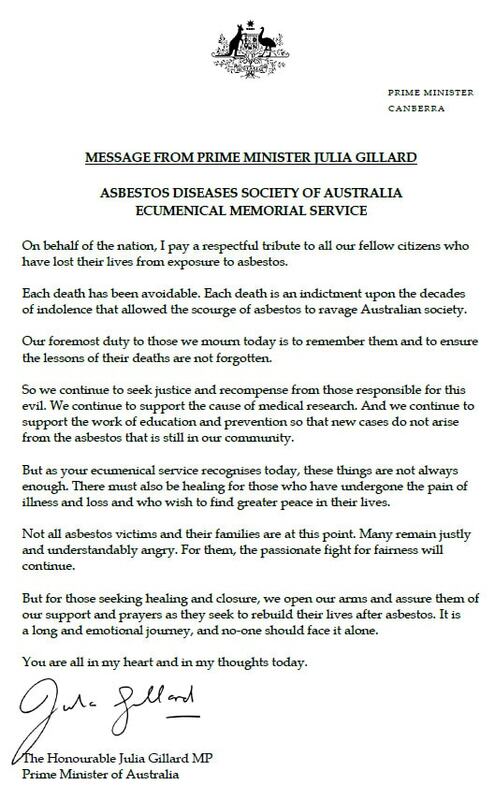 is essential that a cure is found for these insidious asbestos caused cancers." The Asbestos Diseases Society of Australia Inc (ADSA) ‘Rod Triplett Tribute Walk’ for Research and Awareness 2014 from Pemberton to Perth has raised $55,000.00 for lifesaving medical research through the generous support of sponsors and donors. The ADSA Walk also aimed to raise awareness of the killer asbestos fibres being released from the decaying asbestos products that are still in our homes, commercial and public buildings. A cheque for $55,000.00 was presented on Friday 7 November 2014 to Prof Anna Nowak of QEII Medical Centre by Rose Marie Vojakovic AM of the Asbestos Diseases Society of Australia Inc to fund lifesaving research into a cure and treatments for asbestos caused cancers. The asbestos diseases epidemic requires a strong and consistent approach to the funding of medical research towards a cure and treatment for asbestos caused cancers. The ADSA ‘Rod Triplett Tribute Walk’ for Research and Awareness and the ‘Rod Triplett Tribute Breakfast’ with community support has raised lifesaving funds for this vital medical research. 2015 WALK – For information on the Asbestos Diseases Society of Australia Walk for Research and Awareness 2015 contact Simone at the Asbestos Diseases Society of Australia on 9344 4077 or 1 800 646 690 or by email simone@asbestosdiseases.org.au. As mentioned earlier in previous Newsletters, we cordially invite our members and friends including their families to our Christmas Picnic. The picnic will take place at Whiteman Park on Sunday, 7th December from 9:30am until about 4:30pm. Please see the Map below of Whiteman Park showing the location of the ADSA Christmas Picnic in the Mussel Pool Complex between the Shelters Q and W.
A delicious lunch of roast beef and roast pork will be cooked on site including barbecue sausages with gourmet salad and fruit will be provided. Non-alcoholic refreshments i.e., coke, lemonade, water, etc will be available, a can/bottle per person only. We would respectfully suggest that everyone bring additional drinks. COFFEE AND TEA WILL BE AVAILABLE ON A SELF-SERVE BASIS AT THE FOOD SERVICE SHELTER W. This year desserts will be replaced by ice cream and icy poles, however you may wish to bring your own desserts to share with your family and friends. Entertainment will be provided by Rhythm n Groove with music for all ages including well known Christmas carols for everyone to join in singing. Father Christmas (Santa) will make his long awaited yearly appearance to charm the junior brigade and parents. There will be plenty of sweets for the children. Parents can bring a present for their child or children (with first and last name clearly labelled) to be placed under the Christmas tree and Father Christmas will be pleased to present the gifts. Kidz ‘n Sport will provide fun activities and entertainment for the children. To assist our caring volunteers with the catering arrangements please ring our office and advise the exact number of adults and children attending the picnic. Vouchers will be issued at the picnic for the lunch and cool drinks. Please collect your food and cool drink vouchers from ‘Table A’ as soon as you arrive at the picnic. ‘TABLE A’ is marked on the map of the park (see back page). Please don’t forget to bring your own blankets, chairs, tables, sunscreen, hats, caps or any other items that may provide you with comfort to enjoy the day in beautiful Whiteman Park. Our Christmas Stocking is very popular and assists our organisation with fundraising. Please let us know if you can contribute in any way towards the Christmas stocking. Proceeds from the stocking will contribute to our fund raising for asbestos diseases medical research. The 2014 Asbestos Diseases Society Walk for Research and Awareness – Rod Triplett Tribute Walk. 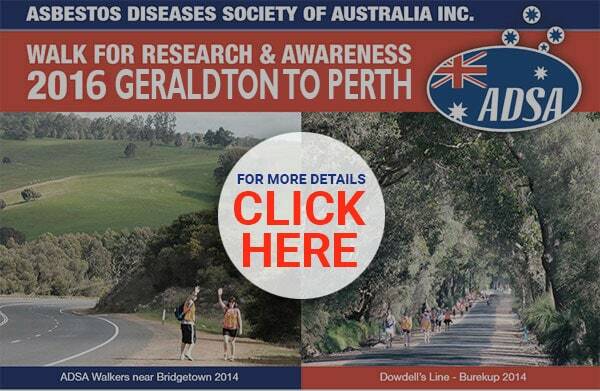 The ADSA Walk 2014 is from Pemberton to Parliament House and will be coming through your town. (See Map for details) We aim to raise lifesaving funds for Medical Research and to raise awareness of the risks of asbestos exposure to our community. Many in the South West Community of WA will remember Rod Triplett through his work building homes all over and for his untiring support of many worthy causes in his home community of Australind. Rod died in March this year from Mesothelioma caused by his work with asbestos building products and his family have kindly consented to our honouring his memory by naming the ADSA Walk 2014 the Rod Triplett Tribute Walk. 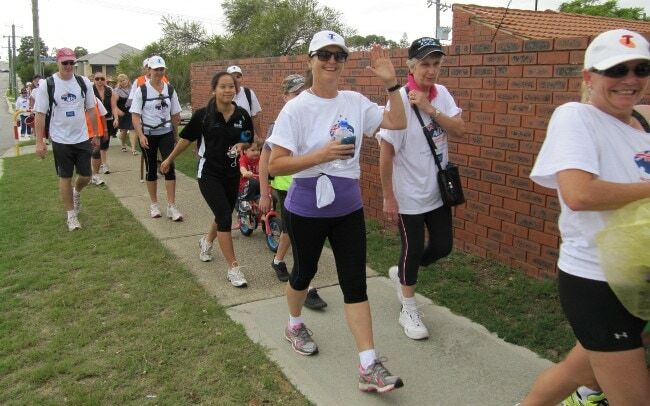 Contact Simone at our office for full details of the Walk and Sponsorship of our Walkers on 9344 4077 or 1800 646 690. Join us for a very special lifesaving event to raise urgently needed funds for Medical Research and treatment of asbestos caused lung cancer and malignant mesothelioma. At the conclusion of the tournament there will be a presentation of prizes to the first three place getters, including the Perpetual Cup to the winning team and Cup Trophies to the 2nd and 3rd teams. Also a delicious barbeque lunch will follow the presentation and not to miss the fundraising auction. There’s a special HOLE IN ONE prize for a lucky golfer – a brand new Nissan X-Trail valued around $30,000 donated by Rex Walker and Mandurah Nissan. Attended by ADSA members, Parliamentarians, and other dignitaries. The ADSA Emeritus Professor Eric G Saint Memorial Award 2014 was presented at the AGM by the Hon. 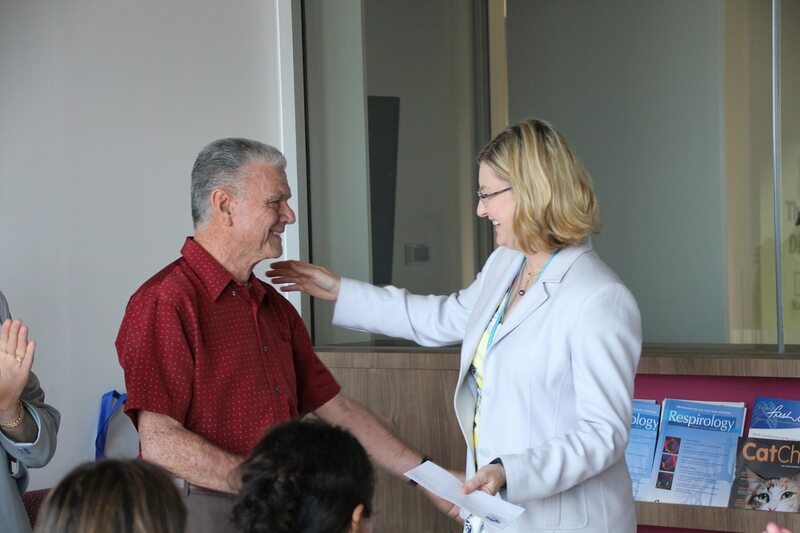 Kate Doust MLC to Professor Anna Nowak in recognition of her visionary and innovative approach to oncology treatment, and for the compassion, understanding and excellence in care she tirelessly provides to asbestos disease sufferers. Much of Prof Nowak’s study and work since 1997 has focused on mesothelioma, a terminal cancer caused by the mineral substance which was widely used in construction and other industries in Australia up until the late 1980’s. 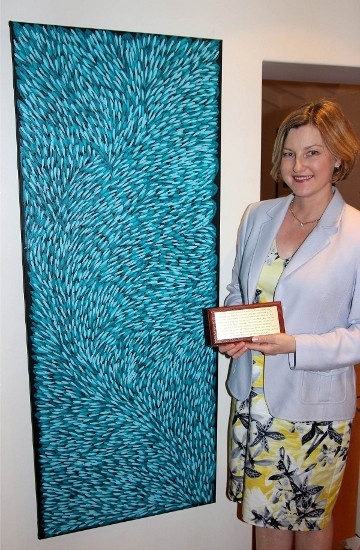 Prof Anna Nowak Emeritus Professor Eric G Saint Memorial Award 2014 recipient with her award a painting by Gloria Petyarre called “Bush Medicine Leaves" 2013 and award plaque. 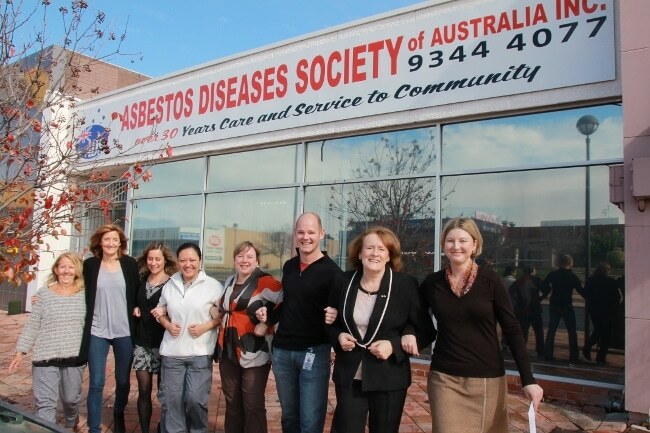 The Asbestos Diseases Society of Australia Inc (ADSA) Walk for Research and Awareness 2013 from Dunsborough to Perth has raised $50,000.00 for lifesaving medical research through the generous support of sponsors and donors. The dedicated work of Prof Nowak and her colleagues at QEII Medical Centre brings hope to asbestos disease sufferers for a cure. The ADSA Walk also aimed to raise awareness of the killer asbestos fibres being released from the decaying asbestos products that are still in our homes, commercial and public buildings. A cheque for $50,000.00 was presented Friday 26 July 2013 to Prof Anna Nowak of QEII Medical Centre to fund lifesaving research into a cure and treatments for asbestos caused cancers. Prof Nowak and two of her colleagues also participated in the ADSA Walk for Research and Awareness as ‘Team NCARD’ walking the last leg from Rockingham through to Parliament House. The Asbestos Diseases Society of Australia Walk for Research and Awareness 2013 has been a great success with all our Walkers enjoying themselves while raising much needed funds for lifesaving medical research into cures and treatments for asbestos diseases. Walking in relays the Walkers did 5km or 10km at a time. The first stretch from Dunsborough through Busselton to Bunbury was the most challenging and that night in Eaton our Walkers were sore but elated to have completed over 80kms of the journey to Perth. Everyone had fun with the friendly kitchen possum that showed up to see what was for dinner. Our cook put on a fabulous pasta night that went down very well with some delicious red wine. Day two, Bunbury to Harvey, saw our first blisters and sore knees but everyone pushed through helped along by beautiful clear sunny weather. We had a warm welcome in Harvey and at camp in Mornington and a big fire with toasted marshmallows. Harvey to Mandurah and our Walkers were settling into the rhythm of walking stopping for ice creams on Mandurah Terrace and then strolling into Keith Holmes Reserve. A few of our Walkers even slipped off for some well-earned drinks. The camp in Byford was in the middle of a lovely forest, chilly but still fun. By day four our Walkers were old hands getting into Rockingham just before the first bad weather we had set in. Some of our brave Walkers opted to do part of the Walk past Rockingham getting soaked by heavy rain and blasted by an unfriendly Westerly. Robert shouted everyone lunch in Byford and it was pub fish and chips all round. On our last day of Walking we were joined by eminent medical researchers from QEII Medical Centre and family and friends for the Walk up to Parliament House. A big crowd of supporters were there to walk in with us including members of Parliament, union members, family and friends. Everyone was elated to have completed such a monumental effort walking from Dunsborough to Parliament House and they were congratulated enthusiastically. When speaking to the Walkers after the Walk the most common experience for them was a sense healing. We are thrilled that our Walkers found the ASDA Walk for Research and Awareness 2013 a rewarding experience and we thank our Walkers, their sponsors, and all our supporters for the generous contributions to our fund raising efforts for medical research. Of course our wonderful Walkers. Our fabulous Cook Karen and her dedicated kitchen helper Christine. the Commonwealth Bank, Peter, Matt, and Natasha, for providing afternoon tea for our Walkers each day. Our coach driver Heinz and Adams Coach Lines. Busselton Shire Councillor John McCallum. The Honourable Mayor of Bunbury David Smith. The Shire President of Harvey Tania Jackson. The Honourable Mayor of Mandurah Paddi Creevey. The Honourable Mayor of Rockingham Barry Sammels. The 2012 Fundraising campaign to save lives –“Kalgoorlie to Perth Walk for Wittenoom Children” raised $75000 for medical research. This year we are inviting members and the public to join us on our walk from Dunsborough to Perth to raise funds for life saving medical research. During the 2013 Walk for Research and Awareness the ADSA will be holding a series of evening town meetings in Bunbury, Harvey, Mandurah and Rockingham from 13th May 2013 to 16th May 2013 where we will have interesting, informed and expert speakers to assist residents and authorities deal with the risks and consequences of exposure to asbestos. All residents are welcome. Please call 9344 4077 or email adsinc@iinet.net.au for more information about the Town Meetings. The ADSA is holding a Town Meeting in Bunbury on Monday 13 May 2013 at 5:30pm at the City of Bunbury Offices Conference Room on Stirling Street, Bunbury entry through the Centenary Gardens entrance. Attendance is FREE and there will be an Asbestos Awareness information pack available. The ADSA is holding a Town Meeting in Mandurah on Wednesday 15 May 2013 at 6:00pm at the Bortolo Pavilion Corner of Bortolo & Murdoch Drive, Greenfields. Attendance is FREE and there will be an Asbestos Awareness information pack available. The ADSA is holding a Town Meeting in Rockingham on Thursday 16 May 2013 at 5:30pm at the Gary Holland Community Centre, Kent Street, Rockingham. Attendance is FREE and there will be an Asbestos Awareness information pack available. The Walk ends 12:00 noon on Friday 17th May 2013 at Solidarity Park opposite Parliament House. The ADS holds an Asbestos Awareness Week in November every year to provide information to the public about the affects asbestos exposure, to raise awareness of asbestos products still within the community, and to provide medical information. 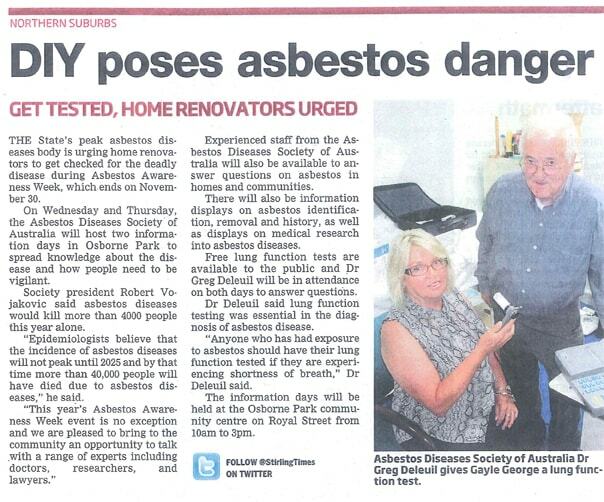 Please click here for an Asbestos Awareness Week Flyer. The Ecumenical Memorial Service in remembrance of those who have died from asbestos-related diseases will be held this year on Friday 29th November 2013 again at the Redemptorist Monastery, Vincent Street North Perth. The details of the theme for this year service will be communicated in our newsletter. However, with the advanced notice of this service, it would be appreciated that as many as possible members and friends attend. As mentioned last year, our kind suppliers of rosemary for the Ecumenical Service are no longer able to assist and we would be most grateful to members and friends for any assistance regarding the supply of rosemary. This year the ADSA Christmas Picnic will take place at Whiteman Park on Sunday, 8th December from 10:30am until about 4:30pm. The entrance to Whiteman Park is off Lord Street, Caversham (Lord Street can be accessed from Reid Highway, Marshall Road or Harrow Street) Also you can enter the Park from Beechboro Road on the north side of Marshall Road. The ADSA designated picnic area is located in the Mussel Pool Complex between Shelters Q and W. If you are not familiar with the Whiteman Park grounds and the Mussel Pool location, please ask the attendant at the gate for directions to the Asbestos Disease Society Picnic situated between Shelters Q and W.
As in previous years, a barbeque lunch (sausages and steak), including a variety of fresh salads and fruits will be provided and also soft drinks of your choice, a can per person, will be available. But we cannot cater for you or your family if you do not RSVP on 93444077. Entertainment will be provided by a popular band with music for all ages, Father Christmas (Santa) will make an appearance to charm the junior brigade and will give gifts and also pass on presents specifically marked for an individual member of a family.